An idioticon (or idiotikon in German) is a glossary - one covering a particular field or area of thinking. To explore the Systems Thinking Idioticon, go to the index. 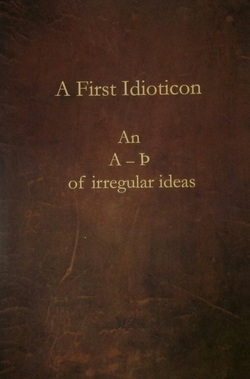 You can also buy A First Idioticon - 20 of the best ideas from the Triarchy Idioticon in a lovely little paperback. The Triarchy idioticon covers some of the most interesting terms that we encounter and love or are intrigued by. Some are familiar to Systems and Complexity Thinkers, many have appeared in Triarchy Press books. Others come from nowhere and offer some lateral connection to things our authors write about. Each reminds us to look out to the wider systems of which we form a part – to see the bigger picture. Sources are shown for each idea and, if we have published a book in the area, it will be referenced. But this isn't meant to be a bookselling operation so much as an idea-gathering one.